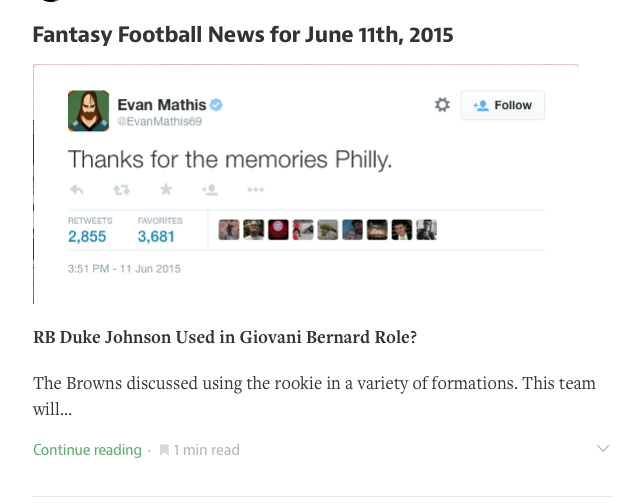 Day by day, we are all flooded with NFL news that’s important for our 2015 Fantasy Football seasons. It’s difficult to keep up with everything that has transpired in a day, and it is difficult to write about the Fantasy Football implications from breaking stories each day. I recently discovered the platform Medium, and I think it will serve several purposes. First, it actually gives you an estimated time on how long it thinks it will take you to read the article. You’ll know exactly what you are getting into. Secondly, it allows you to catch up on important news in one place. I generally will cover a minimum of three stories, but it can take you as little as a minute to read the entire piece. Finally, you get a quick Fantasy analysis. I’ll always write full-length articles on my website, but Medium allows me a way to provide quick initial thoughts. You can check out my Medium posts here. I hope this can serve as an additional tool to provide the readers with value while also saving you time.